Shouldn't I have this figured out by now? Written by acclaimed Twentysomething author Margaret Feinberg, this book takes readers on a soul-searching journey that gets to the heart of their passions, talents, abilities, and life goals. ^What the heck am I going to do with my life? ^^It's a question that just won't go away. ^^Maybe you just graduated with a degree in business only to discover that you hate business. You like the idea of being a teacher except for the students. Or you love public service except for the people. ^^That's when it hits youyou've spent the last few years pursuing what you thought was the career of your dreams, and now you're wondering, "Is this it?" ^^Well, guess what. You're not alone. ^^The good news is it's never too late to pursue your passion. You can still discover that thing you were created to do. You can go back to school, launch a new business, change professionswhatever you'd like. This book is designed to accompany you on that journey. ^Ask the question and be daring enough to find the answer. ^You never know what kind of opportunities might be around the next corner. 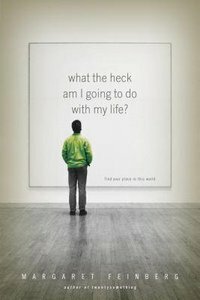 About "What the Heck Am I Going to Do With My Life? (Twentys Series)"